Jani Hale has been Phoenix High School’s principal for many years. 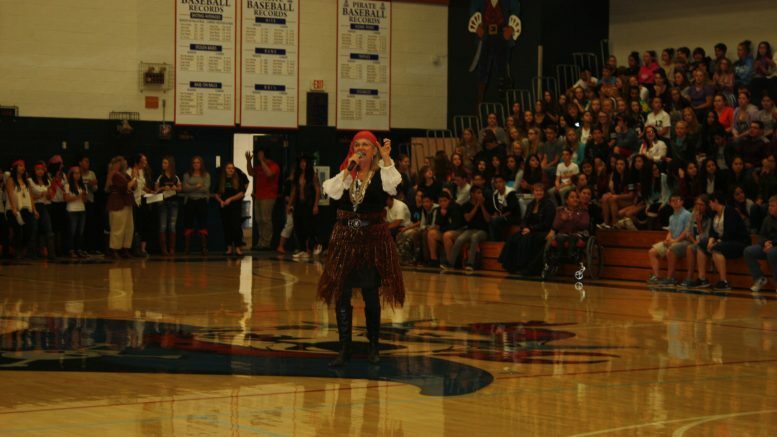 She became the principal, or “Captain,” of Phoenix High School after getting a call from Superintendent, Ben Bergreen. He asked her, “Would you like to be principal of Phoenix High School?” Excited she responded, “YES!” As she hung up the phone, she realized that she was standing at Ocracoke Island in North Carolina, home of Blackbeard the Pirate. She knew from the start that she was destined to become a Phoenix Pirate. Mrs. Hale was in the Medford School District as an English teacher and assistant principal for 19 years before taking the principal job at Phoenix. Another memorable moment occurred in 2014, when she learned that Phoenix had eliminated that graduation gap between Latinos and Anglo students. That day she realized that Phoenix High School’s commitment to see the greatness within all students had born fruit. A fun memory was at an assembly, where she invited all the students to join her on the floor to dance the electric cha cha, and they all did! One thing that she will always remember from Phoenix High School is the kindness of the students. Mrs. Hale says, “I never underestimates kindness. Kindness can open more doors than any test score.” Whenever she would walk down the hall she would ask the students, “How are you?” and she would usually receive, “No, Mrs. Hale how are you?” The warmth, love, and respect she received from the students carried her through some very difficult times. Mrs. Hale has been a huge inspiration to all her students, not only does she believe in every single one of them but she is willing to help them out. Principals like Jani Hale, who is retiring from Phoenix High School at year’s end, have changed the dynamic of Phoenix High School in a big way. The students relish rather than fear conversations with her. Mrs. Hale has had this quote in her office for thirteen years: “It is our light, not our darkness that most frightens us. We ask ourselves, who am I to be brilliant, talented and fabulous? Actually, who are you NOT to be? Your playing small does not serve the world.” I will keep all of you in my prayers for the rest of my life. Go out and serve our world! You will be greatly missed by everyone, Mrs. Hale. 1 Comment on "Farewell to Our Captain"
Words usually come easy to me. After seeing, listening and reading your words and images… I’m speechless. I will forever treasure the gift of this tribute. I’m humbled by the sentiments expressed here.